It will also be printed on the back of your conference leaflet. 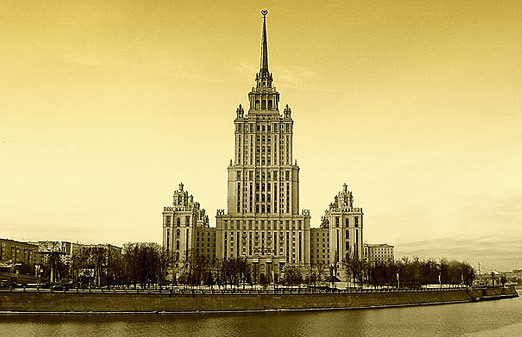 Conference events will take place at the historic Ukraina Hotel (Radisson Royal Moscow). You are likely to arrive at the Vnukovo, Domodedovo or Sheremetyevo airport in Moscow. There you can take Aeroexpress train to the city. You will arrive, respectively, at the Kiyevsky, Paveletsky or Belorussky railway station. The hotel is about one kilometer from the Kiyevsky railway station (Kiyevsky Vokzal) and the Kiyevskaya Metro station (marked M in the map below). If you are at another railway station, you will need to take the Metro. The ticket can be purchased from a machine at the Metro station. Take the Ring Line to Kiyevskaya. You can either walk or take a cab from Kiyevskaya to the hotel (H). Alternatively, you can book a taxi (~$40) at the airport desk or via global taxi service providers like Uber and Gett, as well as Russian Yandex (type "Radisson Royal Hotel, Moscow" in the search field). Please address all enquiries to conference[at]rqc.ru.